My 7-year-old children aren’t colour-blind. They are, however, race-blind. The other day, my daughters asked to watch the video of Madonna’s performance of the song Vogue from the 1990 MTV awards. I’m all about making sure my kids are well-versed in the pop music of 1980s. I mentioned to them that the video was from my childhood, which prompted M to ask whether Madonna was a mommy. I looked up the answer and informed my daughters that the superstar has two daughters and two sons. Two of her children were adopted (from Malawi) and two were biological. We looked at photos, and I noticed that the younger son and daughter had dark skin while the older kids were fair skinned. J offered up that she thought that the daughters had come from Madonna’s belly and that the sons were adopted. Clearly, skin colour played no role whatever in J’s concept of how to differentiate a biological child from an adopted one. 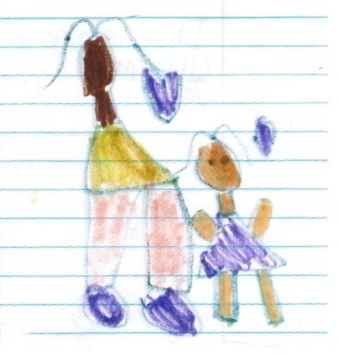 M and J’s drawings of our family and friends reflect our differences in pigmentation. They describe their own skin colour as peach and call mine brown. They refer to their paternal grandmother as being pink. Their friend Olivia is dark brown. If they’re trying to distinguish two friends with the same first name and don’t know their last names, they’ll resort to skin colour as often as hair colour or gender or height to describe them. J’s art indicates that she and I share the trait of having antennae instead of hair. She also correctly perceives my skin as being darker than hers. 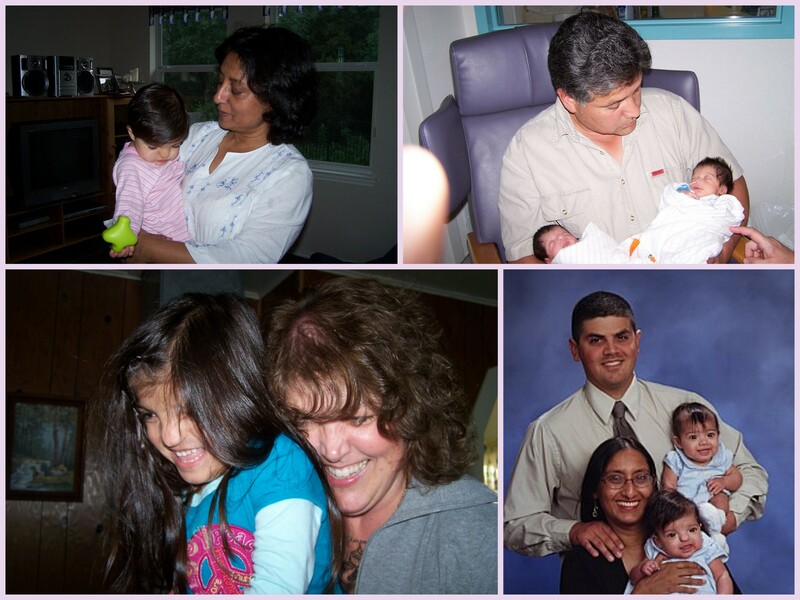 J and M are themselves multi-racial, with two Bangladeshi British grandparents, one White (pink) American grandmother and one Mexican American grandfather. We live in a very diverse area of Central Texas, and at least two of their closest friends have Black fathers and White mothers. J and M with their multi-coloured grandmothers, grandfather and parents. Perhaps this post doesn’t even belong here. This blog is a discussion of multiculturalism. My point is that my girls don’t look at people through the same prism that I do, or that the world has for time immemorial. This post is about the erasure of the cultural assumptions that accompany race and ethnicity. My children have devised for themselves a singular colour-agnostic culture, rather than the complex of multiple cultures I perceive myself to be part of. I think, though, it’s a huge stride towards truly being able to embrace multiple cultures in their full richness. Our children can judge cultural differences on their merits. Unlike the generations that came before, my daughters and their peers explore each others’ cultures without biases inherent in a pigmentation-based categorization of people. “What does ‘bi-lingal’ mean?” my daughter M asked me as I dried her post-bath hair last night. I gave her the first definition that came to mind. Someone is bilingual if they speak two languages equally well. I pointed out that the teachers at her school were all equally proficient in Spanish and English. “Like Mrs. G always talks to Mrs. M in Spanish, and she talks to us in English!” M exclaimed. We live in El Paso, TX, less than 20 miles from the US-Mexico border. There are two main communities that I’ve observed living side by side: the local Mexican-American population, and the army community, made up of soldiers between deployments and their families. The latter group is fluid, moving every year or two. Many army spouses are from countries other than the US, met during soldiers’ international travels. Spanish and English are the languages most often spoken on the street, but I hear plenty of German when I go to the girls’ school to pick them up or onto Ft Bliss, the local base. I used to hear a lot of Korean at our last base, but I haven’t noticed a ton here. I expected that the richness of the language landscape here would lend itself to an appreciation of the benefits of bilingualism. I was shocked, therefore, to learn the there was no Spanish used in the bilingual classrooms at our daughters’ public school. In this school district, “bilingual” is simply code for “English as a Second Language” or even “Spanish monolingual.” The only Spanish-English dual immersion school programs are “on the other side of the mountain” in the more affluent Caucasian neighbourhoods to the west. I once toyed with the idea of getting a PhD in code-switching, the interweaving of two or more languages by people equally comfortable with all the languages in use. After having lived in El Paso for 6 months, I think a more fascinating topic is the relationship between people’s language usage and attitudes in multi-lingual communities. Although my husband and I are members of the army community, our dark skin makes us blend into the long-term El Paso community. The language use I’ve observed in local places of business has been an eye-opener. At shops that are part of national chains, the initial welcome from the staff is in English, but the next utterance is in Spanish. If the customer responds in English, the conversation switches to English. If the customer responds in Spanish, the remainder of the conversation continues in either Spanish only, or Spanish with some English words. If the customer is fair-skinned, however, Spanish doesn’t make an appearance. The contrast was noticeable when my very fair mother-in-law visited. When we go to local mom-and-pop establishments, though, conversation is in Spanish exclusively until my husband forces the issue by holding to his English, or my mangled Spanish causes the store employee to take pity on me. I hope that my daughters learn the utility and beauty of bilingualism from their classmates before the narrow-minded perspective of the local school system imposes itself on them. I want them to know that being bilingual is a strength, and something to be admired. It doesn’t equate to not speaking English. You’ve heard the joke, right? Sadia was born in the United Kingdom to parents who were born in Bangladesh back when it was still East Pakistan. At the age of 8, she moved “back” to Bangladesh with her parents, where she lived with one foot in her local extended family culture and the other in the expatriate world. She found her way back to the life in the West pursuing degrees in California and Texas. Since that was far too simple an identity for one person, she mixed things up by marrying an American soldier of Mexican-American and Scots/Irish/French-American descent. Their identical twin daughters, M and J, are now 5 years old, and would probably identify themselves as Twin-American above all else.